Moving right along to the 6th and final 4-star commitment of Saturday, February 18th – also known as the greatest recruiting day in the 133-year history of the Michigan football program. Get a peak at this class on our 2013 recruiting board here. 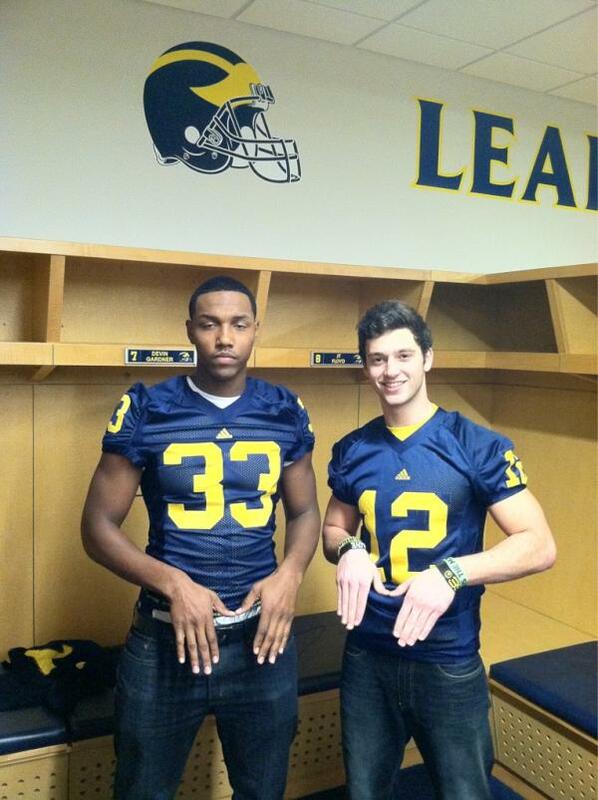 Taco, left, posing with fellow 2013 QB commit Shane Morris. Taco, what a name by the way – Moe Sport Shops is going to have a field day with t-shirt ideas, is rated with 4-stars across the board by all the gurus. He's listed at 6-6, about 240 pounds, which is an impressive size for a junior DE/OLB in high school. He's widely considered to be one of the best defensive recruits out of the state of Ohio for 2013. Given his size, he seems like he'd fit nicely into a strong-side defensive end position. Not so much an outside linebacker. There is likely to be a logjam at DE in the next couple years, but I think Taco could make a name for himself there if given the chance. He'll probably redshirt unless he shows up to campus and is simply too good to sit out. Cincy, Illinois, Iowa, Nebraska, Notre Dame, Pitt, Purdue, Syracuse, UCLA. Interest from BGSU, Dayton, LSU, Sparty, Ohio State, Wisconsin and Xavier.